She heard that the powerful radio station in Cincinnati, Ohio WLW, was looking for a girl singer and she sent her acetate recording of the old Jimmie Rodgers classic, "Freight Train Blues," on which she sang and did some yodeling. She got the job! 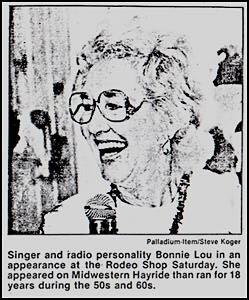 Since the name Sally Carson was owned by the Kansas City radio station, Bill McCluskey, husband of Millie Good) one of the two sisters that made up The Girls of the Golden West), An executive at WLW, renamed her Bonnie Lou. She joined the Midwestern Hayride, a country and western radio show. Her singing and yodeling fit perfectly into this format. Now - she was singing alongside some of her heros, The Girls of The Golden West. For a while after 1948, the Midwestern Hayride was on both radio and television. The Midwestern Hayride went on the air February, 1948 and lasted until 1972. Bonnie Lou sang on a radio show on WLW called Boone County Neighbors and during a broadcast on November 25, 1945 an acetate was cut which included Chet Atkins and The Brown's Ferry Four among others. An acetate was also cut on October 6, 1945, while she was on the radio show Midwestern Hayride. These acetates still exist and have transferred to compact discs. In the fifties, a poll was taken by DOWN BEAT Magazine, Bonnie Lou was voted the NUMBER 5 BEST FEMALE SINGER. 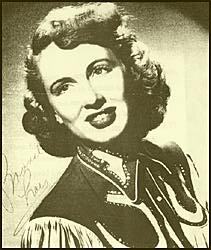 Bonnie had been featured in the Country Song Roundup numerous times and was voted the number ywo Best Female Artist and "Tennessee Wig Walk" was voted number 4 Top Song. She was featured in the March 5, 1956 issue of LIFE Magazine. I had some national country hits on King Records in the early 1950's including Seven Lonely Days and Tennessee Wig Walk. Got them into the top ten in '53. But when the rockabilly thing got popular in '55, King directed me that way. Daddy-O was my big one, in '55, but there were other records, too, like Lah Dee Dah with Rusty York. The people at King always got the songs for the artists. They told us what to record. King had a lot of country and rhythm and blues artists then, you see, and sometimes both black and white would play on the sessions. It was so hard to keep the records country; some players wanted to do a Detroit-type of thing. I think that's why I had no further success. Anyway, "Daddy-O" was a cute song. The King people told me to keep the infection - the yodeling feel. So I did, but I think the record was ahead of its time. We cut it in the King studios in Cincinnati. I did all the background vocals, but the sound on my records was too mixed, part country, part R&B. It got the artists and the public confused, I believe. You to do one thing or the other. People won't accept it unless your focus. You can't have a mixed bag. Myself, I was always a country singer. I grew up singing country music as girl in Bloomington, Illinois, where my parents used to take me to festivals and lodges just to perform. I learned to yodel from my grandmother, who came from Switzerland. As a child I was known as the Yodeling Sweetheart, Mary Jo. I sang on the radio in Kansas City at the age of 17, and a short time later I was hired by WLW Radio in Cincinnati. A station executive named me Bonnie Lou. At one time I was supposed to sign with RCA Victor, but instead I went with Fraternity Records just because it was local. I should have had more sense. I've always wanted to stay in Cincinnati, though, because of my family and profession. There is a loyalty in country music that you don't find in other fields, you see, and, besides, country was me. So I remained in town doing radio and television, and I have never regretted not moving to New York. People still call and say they love my work. It's gratifying. I've always admired and respected my public. as a vocalist as a vocalist on WLW television on the Ryth Lyons 50/50 Club Show. She also sang and talked on the Paul Dixon Show. 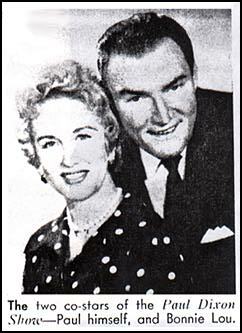 When Ruth Lyons retired in 1967, Bob Braun took over and Bonnie Lou continued to sing and perform on the show. She record her first King record in March of 1953 and her record of "Seven Lonely Days" rose to the top 7 on the country charts. This song was covered by Georgia Gibbs for the pop market and has become a country standard with versions by Patsy Cline, Jean Shepard, Billie Jo Spears, Wanda Jackson and k.d. Lang. The other side of Bonnie's record "Just Our of Reach of My Two Empty Arms" has also become a country classic with covers by Jim Reeves and Faron Young. Later in 1953, Bonnie recorded "Tennessee Wig Walk" which rapidly climbed to the number 6 spot. She also had hits with "Daddy-O" (#14) in 1955-56 and "Lah Dee Dah" (a duet) with Rusty York in 1958. "Daddy-O" hit both the Billboard and Cash Box pop charts and was covered on Dot by The Fontaine Sisters. It was a hit in Europe in the rock and roll clubs in the '80s. "Daddy-O" was written by Buford Abner, Charlie Gore and Louis Innis. The latter two worked on Midwestern Hayride with Bonnie Lou. In 1954 she had a recording of the song "Two Step Side Step". It was written by Murray Wilson, who is the father of Beach Boys' Brian, Carl and Dennis. The song was recently featured in a TV movie about the Beach Boys. At her final session for King Records in January of 1958, she sang a duet with rockabilly Rusty York to record a cover version of Billy & Lillie's Lah Dee Dah and a teen pop song titled "Let The School Bell Ding-a-Ling." Bonnie Lou has worked with Paul Cohen for his Todd label and she had several recording on the Fraternity label. 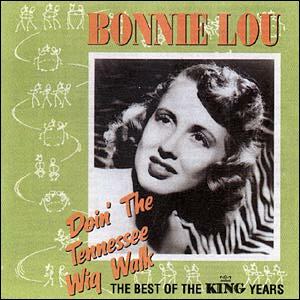 In early 2000, a compact disc: "BONNIE LOU - Doin' The Tennessee Wig Walk - THE BEST OF THE KING YEARS," was released on the Demon-West Side label out of London, England. It contains all 24 of the songs she cut for King and two previously unissued, undubbed versions of "Tweedle Dee" and "Kit-N-Kaboodle". The disc contains 26 cuts recorded from 1953 to 1958 and contains virtually all the recordings Bonnie Lou made for King Records. Bonnie met her husband Milt Okum, who is one of her biggest supporters (he does parlor magic as a hobby) and they maintain homes in Cincinnati, Ohio and Cape Coral, Florida. Both names now (Mary Jo Okum and Milt J. Okum) have the same initials, MJO. They are both retired and spend part of their time in Florida and the rest in Cincinnati. Bonnie Lou is one of the most caring, giving people ever to sing a song, and, to this day, she is a true professional.